It takes several triathlons to learn the little tricks of the trade — mostly by either making mistakes or by watching other people. Here’s a few tri tips to save you some trouble. 1. Warm up in the water. I can’t stress this enough. A lot of first-timers don’t want to waste extra energy because they’re nervous about the swim. When the starting gun goes off, the shock of the cold water hits you and your adrenaline kicks in, With your heart racing, it’s easy to panic. Breathing becomes much more difficult if you’re cold and scared. Go out in the water about ten minutes before and take a few strokes. 2. Even though you might be used to working out without eating, consider eating something before your race. Between driving to the race, setting up your transition area, and waiting for your wave, it could be hours between when you wake up and start the race. Practice eating a few different meals during training to make sure you don’t cramp up. My favorite meal is a whole wheat English muffin, peanut butter, and some apple slices. 3. Tuck your timing chip under the leg of your wetsuit. 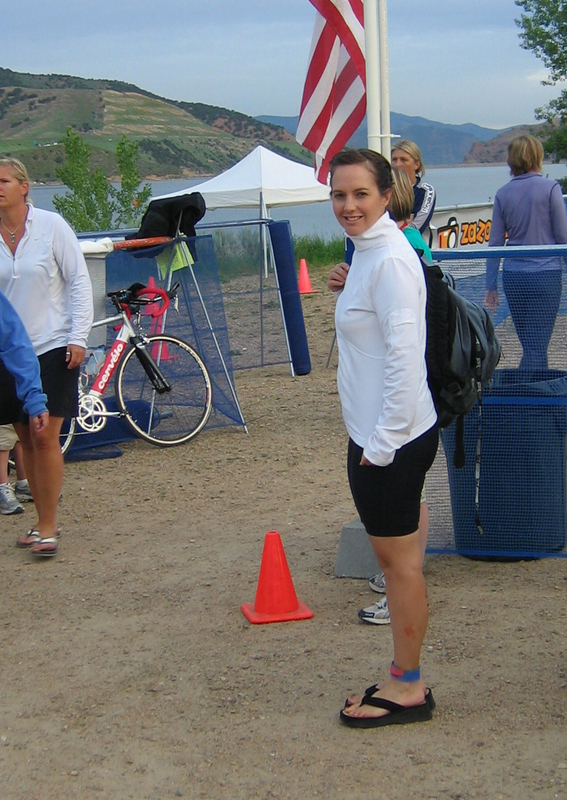 At my first tri I left it untucked, and I wasn’t able to pull off my wetsuit. I took the chip off, then forgot to put it back on. I lost four minutes in that transition. 4. Stop every ten strokes and check your position. I’ve watched people swim the opposite way. 5. Experiment with energy supplements during your training to find out what works for you. Some people tape energy packets to their handle bars and rip the tips off. I’ve tried this but mine always fall off. I’ve also given up on liquid packs because I end up sticky all over and waste way too much time trying to wash my hands off with my water bottle while trying to bike. Now I use the chewy candy things. 6. Try on your helmet before your race. This is especially is important for women who do their hair without thinking about how tough it’s going to be to put on a helmet over a ponytail. 7. If the tri will require you to run through sand, keep a small bucket of water in the transition area to douse your feet in. Wet sand does not rub off. 8. Bike with no socks. It’s too difficult to put dry socks on wet feet. 9. Remember the worst part of the run is the first half mile when your body still thinks it’s on a bike. It does get better, just keep moving. 10. Try to smile when you cross the finish line even if you’re about to throw up. You’ll want those pictures. Last of all, don’t make a decision about your next tri the day of your first. Eventually the pain will fade and you will want to do it again.